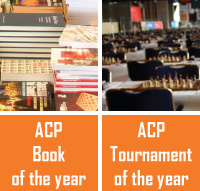 ACP Board is pleased to announce the wild cards for the 2018 Tata Steel CHess Tournament in Wijk aan Zee. GM Maxim Matlakov - Masters wildcard. GM Dmitry Gordievsky - Challengers wildcard. GM Michal Krasenkow - Veteran spot in Challengers. The wildcards are based on the ACP Tour standings of December 1st, 2017. We thank the organizers for this fruitful cooperation and wish a great success to the 80th edition of the World's most famous chess tournament.